Every year Americans spend billions of dollars on material items at Christmas. 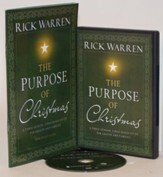 Is this the way to celebrate the birth of Jesus, who gave up his riches to save the world? 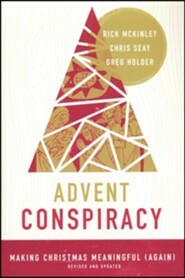 In this Advent Conspiracy Study Pack for individuals, pastors Rick McKinley, Chris Seay, and Greg Holder talk about how to be counter-cultural in a consumer driven world. They show you how to recapture the beauty of Jesus and restore the "scandal of Christmas" by substituting compassion for consumption. Worship Fully - Because Christmas begins and ends with Jesus! Spend Less - And free your resources for things that truly matter. Give More - Of your presence: your hands, your words, your time, your heart. Love All - The poor, the forgotten, the marginalized, the sick, in ways that make a difference. The Advent Conspiracy Study Kit contains (1) Advent Conspiracy book, ISBN 9780310324522 and (1) Advent Conspiracy DVD, ISBN 9780310324423. The story of Christs birth is a story of promise, hope, and a revolutionary love. So, what happened? What was once a time to celebrate the birth of a savior has somehow turned into a season of stress, traffic jams, and shopping lists. And when its all over, many of us are left with presents to return, looming debt that will take months to pay off, and this empty feeling of missed purpose. Is this really why we celebrate Christmas? 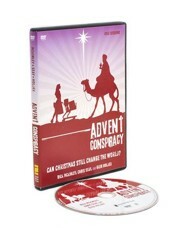 What if Christmas became a world-changing event once again? [AC] Advent Conspiracy is an international movement restoring the scandal of Christmas by substituting compassion for consumption. 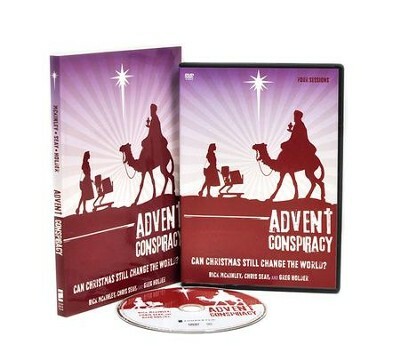 For three years, Advent Conspiracy has been giving people hope that Christmas doesnt have to be about credit cards, to-do lists and traffic jams. This four-session DVD study will introduce you to this revolution in compassion as you learn to: Worship Fully. It starts and ends with Jesus. Its a season where love wins, peace reigns, and a king is celebrate. Its the party of the year. Spend Less. Americans spend an average of $450 billion a year every Christmas. What if we all committed to buying just one less gift this year? Give More. Gods gift to us was a relationship built on love. Time is one of the more precious gifts we can give at Christmas, time to make love visible through relational giving. This Christmas, give presence to those you love. Love All. When Jesus loved, he loved in ways never imagined. By spending less at Christmas we have the opportunity to join him in giving resources to those who need them most. Nobody wants a Christmas worth forgetting. 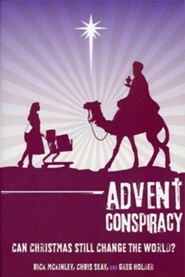 Welcome to the Advent Conspiracy. I'm the author/artist and I want to review Advent Conspiracy, Study Pack.